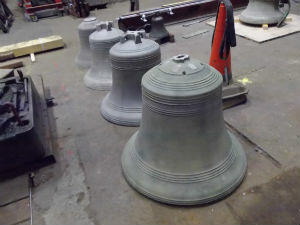 On 16th February, a group of 20 of our bellringers and others from the village travelled up to Loughborough to watch our new tenor bell being cast. John Taylor & Co, who are restoring our bells, have the only remaining bellfoundry in the country. 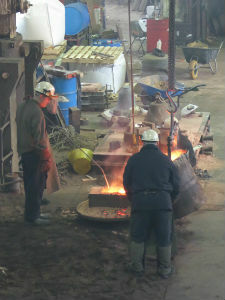 It has been operating since 1859, and the feel of the foundry is similar to that which would have been the case then. It was a marvellous example of the modern application of ancient techniques, including the stirring of a pot of molten metal at 1200 degrees centigrade with a stick of willow, and the moulding of the cast using clay mixed with horse droppings! At a special service held on 25th August, Bishop Karen commissioned the recently restored bells at St Mary’s Church, Shroton. In her sermon she treated us to a fascinating history of bells in worship, and emphasized the importance of their ringing out across the village to call people to prayer. Present at the service was Simon Adams from John Taylor & Co of Loughborough, the nation’s sole surviving bell foundry. 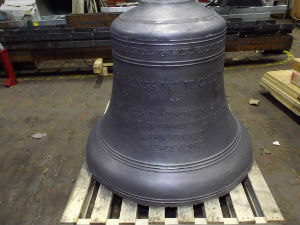 Our new tenor bell was recast there last February. The village of Shroton has raised over £50k to enable this restoration to take place, with much appreciated assistance from several trusts and from Heritage Lottery Fund. 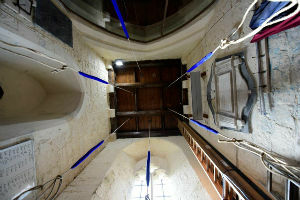 The work was masterminded by Tower Captain Malcolm Trowbridge, who also arranged for a CCTV camera to be installed in the bell loft, so folk below can see the bells actually in action. On Saturday 26th August, six bell ringers rang 5,040 Surprise Minor changes in 2 hours and 58 minutes. The new tenor bell carries the inscription “My voice rings out to call you home”, reflecting the age old function of church bells, designed to remind people from all parts of the community that the Church is here to enable them to come and worship Almighty God. Shroton’s PCC hopes and prays that this will be a feature of St Mary’s Church for many years to come.